Kementerian Badan Usaha Milik Negara Republik Indonesia - Kementerian BUMN is the Ministry of State Owned Enterprises of the Republic Indonesia and is a ministry in the Working Cabinet of Republic of Indonesia (Kabinet Kerja) that oversee the development of state-owned enterprises (BUMN) in Indonesia. According to information found in Kementerian BUMN's websited as cited by JobsCDC.com, Kementerian BUMN - or commonly known as the Ministry of SOEs - oversees 138 state-owned or Government-owned companies/corporations as at the end of May 2013, including 20 public-listed state-owned companies, 104 non listed state-owned companies and 14 Public Corporation (PERUM). 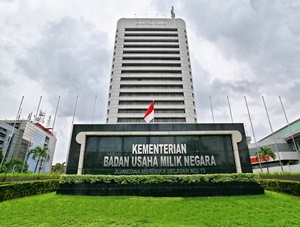 Kementerian BUMN is domiciled in Jakarta and its head office is registered at Jl Medan Merdeka Selatan No 13, Gambir Jakarta Pusat 10110. Kementerian BUMN is headed by a minister of state owned enterprises, who is under and directly responsible to President. In the Cabinet lead by the President Joko "Jokowi" Widodo, KBUMN is headed by Rini Soemarno as the Minister of State Owned Enterprises to replace Dahlan Iskan. She is the former the Minister of Industry and Trade on the period of 10 August 2001 – 22 October 2004. Kementerian BUMN is organised as 1 secretariat general, 8 deputies and 2 expert staffs. S1 Degree, majoring in Business, Business Science, International Business, Economics, Economics Science, Business Economics, International Economics, Economics Development, Economics Finance, Economics Management, Accounting, Sharia Accounting, Accounting Science, Accounting Finance, Accounting Management, Accounting Information System, Management, Organizational Management, Human Resource Management, Management Science, Business Management, Financial Management, Administration, Administration Science, Business Administration, Financial Administration, Banking Management, Sharia Banking Management, Industrial Engineering, Electrical Engineering, Industrial Technology, Civil Engineering. S1 Degree, majoring in Communication, Communication Science, Visual Communication Design, Publisistik, Journalism. S1 Degree, majoring in Communication, Communication Science, Public Relations, International Relations. S1 Degree, majoring in Law, Law Science, Business Law, Constitutional Law, Civil Law, Criminal Law, Administrative Law. S1 Degree, majoring in Statistics, Economics, Economics Development, Management, Accounting, Business, Business Science, Accounting Science, Financial Accounting, Management Accounting, Economics Science, Financial Management, Statistics Science, Economics Statistics, Financial Statistics, Applied Statistics. S1 Degree, majoring in Economics, Economics Development, Management, Accounting, Business Science, Accounting Science, Financial Accounting, Management Accounting, Economics Science, Financial Management. S1 Degree, majoring in Management, Management Science, Organizational Management, Economics, Administration Science, State Administration, Public Administration, Public Policy Management, Industrial Engineering. S1 Degree, majoring in Information System, Information Technology, Computer Science, Computer Engineering, Informatics Engineering, Electrical Engineering, Informatics and Electrical Engineering, Mathematics. S1 Degree, majoring in Information System, Information Technology, Computer Science, Computer Engineering, Informatics Engineering. JobsCDC.com now available on android device. Download now on Google Play here. Please be aware of recruitment fraud. The entire stage of this selection process is free of charge. Kementerian BUMN - 88 Formations CPNS Kementerian BUMN September 2018 will never ask for fees or upfront payments for any purposes during the recruitment process such as transportation and accommodation.